Women's hockey is evolving and the divide between female and male athletes is blurring. Canadians are viewing female athletes as just that, athletes. We're not satisfied with the notion of "they play well for a girls team." Female competitors play well, period. Eleven year old girl hockey player portrait on an ice rink overlooking Lake Michigan in Wisconsin. No one wins Olympic Gold or a World Championship without facing adversity along the way. Throughout my hockey career I've faced many tough losses and gone through hardships -- but no matter the score, I've always had the support and strength from my family and friends on and off the ice. My parents are the difference makers in my life, providing me from a very young age the greatest opportunities to play the game I so love, making immeasurable financial sacrifices and giving so much of their time. Having that respect come from your coaches, trainers, teammates and family really makes a difference in a person's confidence while playing the game. Last month I had the chance to coach 19 of Quebec's best 11 and 12-year-old girls' hockey players during the Quebec City's revered Tournoi International de Hockey Pee-Wee. We shared moments similar to those that I had as a child while facing adversity, but as a team we were able to bring to life the values of resilience, welcoming and generosity shared by Canadians. I'm proud and lucky to be a part a new generation of mentors and coaches, all made possible by the expansion of women athletes to a global level. 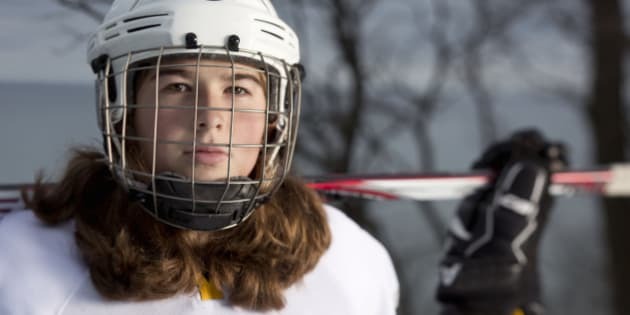 Recently, I was able to work with some of these girls again in a short film created by KFC with the Lac St-Louis Selects and Rafales de la Mauricie hockey teams. The film takes a deeper look into what's happening every day, in every city, at every rink, and focuses on the common ground Canadians have found when they take the time to share real and authentic stories. The video also shows how important it is for young girls to have a positive influence every step of their sports journey. On the heels of International Women's Day, I believe mentoring and supporting young women in sport is so important to the development of these young athletes and shouldn't be taken lightly. Nowhere in the world is more passionate about hockey than Canada, but often it's the moments and emotions shared off the ice that make the game mean so much more. The support we can provide as mentors off the ice is just as important as the coaching these girls receive on the ice, and that's what I loved about making this film -- it showcased how families come together during moments of loss to foster a sense of comfort. I hope that by sharing my story I can help to inspire female athletes to continue working hard and chasing their dreams to play for the Clarkson Cup, a World Championship and an Olympic Gold Medal one day.